3,917 km ridden at an average speed of 36.03 km/hr. 130 starters, 90 classified finishers. This was the first Giro to test for drugs, with 8 confirmed positives. This was also the first Giro to have a prologue time trial. Eddy Merckx, the world road champion, took the lead the lead in stage 12 with an incredible ride ascending Tre Cime di Lavaredo. No one was in Merckx's class as he won his first Grand Tour. Note: Gianni Motta, who was fifth in GC and fourth in points was subsequently disqualified for doping. Other riders with doping positives in the 1968 Giro: Raymond Delisle, Peter Abt, Franco Bodrero, Franco Balmamion (cleared), Victor van Schil, Felice Gimondi (cleared), Mariano Diaz, Mariano di Toro (refused test). By the mid-1960s doping and cycling had become inextricably intertwined. At one race Nencini needed help chasing down a break, so he openly handed out drugs from his jersey pocket to his fellow riders. It was just part of the job. Amphetamines were the era’s performance-enhancers of choice. But there were other ways to go faster. We know that Gastone Nencini practiced autologous blood doping, reinjecting his own saved blood to increase his red blood corpuscle supply. It is thought since tests are now available for most chemical performance enhancers, modern endurance athletes have, with some sophisticated modifications, gone back to this tried and true method. Racers in the 1960s took other drugs as well, solucamphre to improve breathing (now they get a doctor’s prescription for asthma medicine; it seems a surprising number of the world’s finest endurance athletes are asthmatics who can barely breathe), even caffeine suppositories. It may be that by this time riders were already using steroids. They were available, but one cannot know for sure. This is not a period for which there is a lot of documentation about drug use because, while the riders did not think they were doing anything more than they needed to do their job, they generally kept the entire subject their little secret. But the times were changing. The days of Fausto Coppi and Jacques Anquetil making no bones about their drug use, though not bragging about it either, were rapidly coming to an end. Replacing this badly kept secrecy was a code of silence, a mafia-like omertà that nearly all members of the cycle racing business honored. The riders kept discussion of drug use off the table not only while they were racing, but during their entire lives. Journalists who asked about drugs soon found themselves without access to the riders. It was and is an eerie thing, the riders demanding the right to cheat each other by performing extraordinary abuse to their bodies and (if my feelings about Charly Gaul and a couple of other retired racers are correct) their minds. There had been several shocking episodes of drug overdose by riders. In the 1955 Tour, Jean Malléjac had collapsed on Mont Ventoux with one foot still strapped in the pedal, convulsively pedaling the immobile bike. 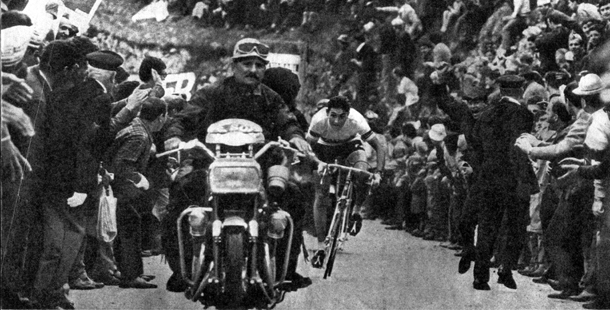 Roger Rivière crashed out of the 1960 Tour when he tried to follow Gastone Nencini down a mountain. It turned out that he had taken a combination of amphetamines and painkillers (riders took opiates to deaden the pain in their muscles) that made it impossible for him to feel his brake levers and correctly modulate his speed. Later that year Dane Knut Jensen died during the Olympic road race in Rome. He was known to have used a combination of amphetamines and nicotinyl alcohol. Starting in 1964, laws against doping in sport were passed in Europe with Belgium being the first. In 1966 The Tour began rudimentary testing for drugs. In the 1967 Tour another rider tragically collapsed, again on Mont Ventoux. Under a baking sun, British racer Tom Simpson fell from his bike while suffering from acute dehydration caused by diarrhea, an overdose of amphetamines synergized by brandy and exacerbated by the race organizers’ refusal to make water readily available. Simpson died, the drugs having overridden his body’s screaming signals that it was in crisis. Two other riders in our story also broke down and came close to suffering Simpson’s fate: Arie Den Hartog, and Anquetil’s friend and domestique, Lucien Aimar. This was a deadly business and it had to be brought under some level of control. The riders fought dope testing and clean-riding rules then, and many still do, albeit with less openness and decreasing effectiveness. Back then there were occasional strikes including one at the 1966 Tour. Anquetil was among the most forceful and visible opponents of dope testing. At the 1966 World Championship (won by a Motta-aided Altig, remember?) the riders refused to give urine samples, daring the UCI to strip them of their results. The UCI folded and Altig is still on record as the 1966 Road Champion. The sport clearly had and has a long way to go. Finally, in 1968 the Giro announced that it would begin testing riders for drugs. The day before winning the 1967 World Championship, Merckx signed with the Italian Faema squad, leaving notoriously tight-fisted Peugeot. At Faema he blossomed under the direction of Giacotto with his well-funded organization. Merckx’s diet was changed. He lost weight, which vastly improved his climbing. He learned how to train properly. Until he was recruited by Faema he had never attended a pre-season training camp. The raw talent that could already win almost any single-day race was honed into a powerful racing machine capable of not just winning, but dominating stage races. Faema, being an Italian sponsor, wanted Merckx in the Giro and at that time had little interest in the Tour. So the Giro it was for the man who that spring had already knocked off the Tour of Sardinia, Paris–Roubaix and the Tour of Romandie. Faema had assembled a group of superb athletes to support Merckx: Adorni, Roger Swerts, Guido Reybrouck and the tallest rider in the pro peloton, Martin van den Bossche. Filling out the field were 1968’s Vuelta winner Gimondi (with Altig on his team), Jiménez, Luis Ocaña, Zilioli, Bitossi, Balmamion, Motta, Pingeon, Dancelli and Gabica. Again, it was an excellent international field. The Giro adopted its first prologue individual time trial, 5.7 kilometers at Campione d’Italia, a little enclave of Italian territory in Switzerland across the lake from Lugano. It was an unusual format with the 130 starters racing in 10 groups of 13 riders and the best of the winners of these 10 groups was declared the stage winner. Charly Grosskost got to wear the year’s first Pink Jersey, though the day’s efforts did not count towards the General Classification. The first road stage left from Campione d’Italia. Merckx was first in to Novara with Marino Basso leading in the rest of the peloton six seconds later. The next day was won by Motta, just a second ahead of Merckx, and added a sad chapter in the Giro’s history. Three riders were later found positive for dope: Motta, Raymond Delisle and Peter Abt. Testing at this time was still primitive and given the era’s near universal use of drugs, finding just three competitors with banned drugs in their systems does give truth to the riders’ charge that the tests were unfair, unreliable and capricious. It was obvious that many other riders were getting away with using drugs. But the testing had to start somewhere. Eddy Merckx wins stage two in Novara. Dancelli was part of stage three’s fuga di bidone. The escapees gained more than four minutes on a unified pack, giving the Pepsi rider a solid lead of 4 minutes 3 seconds over Merckx when the riders arrived in the Piedmont town of Alba. In 1964, suspicions that Merckx had heart problems nearly kept him from riding the World Amateur Road Championship at Sallanches, which he won. Now, four years later Faema team doctor Enrico Peracino, who had been working with Giacotto since the Carpano days, found that Merckx suffered from a non-obstructive hypertrophic cardiomyopathy, a potentially dangerous thickening of the heart muscle that occasionally kills young athletes. Worried, Peracino brought in a cardiologist to look at Merckx that evening in the hotel at Alba. To keep from scaring young Eddy, both Merckx and his roommate Adorni were given electrocardiograms. The cardiologist decided to keep an eye on Merckx that evening and retest him in the morning. Still deeply worried, he nonetheless decided to let Merckx continue racing. As I write this in 2010, Merckx has enjoyed his 65th birthday. The next day’s stage ended in San Remo and the mass spectrograph caught another rider, this time Molteni rider Franco Bodrero. Stage five raced a tough circuit that went over the Ghimbegna pass in the mountains behind San Remo. Zilioli and Merckx broke away, hammering out a two-minute gap over the Dancelli/Adorni/Gimondi chase group. Dancelli was still in pink, but Merckx had halved his deficit, now at 1 minute 55 seconds, while Zilioli was third, just 5 seconds off Merckx’s pace. The peloton was starting to get a feel for the sort of tyrannical dominance that Merckx would be imposing upon European racing over the next seven years. He won stage eight into Bréscia with teammate Adorni leading in Dancelli eight seconds later. Along with Motta and Zilioli, Gimondi, who was determined to fight the Belgian tooth and nail, lost 48 seconds. They were to learn that time given up to Merckx was retrieved only with great difficulty, if at all. Into the mountains they went with stage ten finishing atop Monte Grappa. Emilio Casalini, a rider on Merckx’s Faema squad whom Adorni describes as just a modest gregario, escaped and managed to solo across the line 46 seconds ahead of a frowning, sullen Merckx. Merckx was out of sorts because someone else had grabbed a crumb that might have been his. Gimondi came in thirteen seconds later and Dancelli, really riding well, was five seconds behind them. Dancelli’s lead was down to a minute and a half. That lead would get a hard test in stage twelve with its finish atop the 2,320-meter-high Tre Cime di Lavaredo, where bad weather was forecast for the day. Partway through the stage, twelve riders escaped and gained a nine-minute advantage. Merckx finally decided to react and went after them with Willy van Neste. Merckx had mechanical trouble and had to change bikes while van Neste went on ahead. Merckx soon overtook van Neste. Through cold rain and snow (one journalist called the conditions “Dantesque”), clad in a short-sleeve rainbow jersey, wool cap, thick gloves and shorts, Merckx plowed ahead, catching and dropping the break that started the climb with a nine-minute lead. He went on alone to win at the top of Tre Cime di Lavaredo by 40 seconds over Giancarlo Polidori, the only survivor of the initial break, and 54 seconds over third-place Adorni. Further down the mountain there were those who couldn’t take the bitter cold and became little more than pedaling zombies. The ease with which he ascended the day’s stiff slopes left his competitors shaking their heads in disbelief. One newspaper writer said Merckx had “climbed like a pursuiter”. He had left Motta and Zilioli more than four minutes behind while Gimondi conceded 6 minutes 25 seconds. Merckx later wrote that he rated the 1968 Tre Cime di Lavaredo stage win as his best-ever day in the mountains and one of the three greatest points of his career along with his 1969 Tour de France victory and gaining the World Hour Record. For Gimondi the day was pure misery. He finished the stage in tears, more than six minutes behind the Belgian bulldozer. He was crying not because he did badly in a race, he said that is to be expected in sport. But people from his hometown had traveled to watch him and he felt he let them down. Merckx was now the maglia rosa. The next day had the last of the Dolomites, to no effect upon the standings. But in Vittorio Veneto where the stage ended, Franco Balmamion came up positive for dope. Heading south for its finish in Naples, the Giro stopped at San Marino for a 43.9-kilometer time trial. Gimondi shot up the mountain, beating Merckx by 39 seconds, even catching and passing Motta on the way. The tifosi were thrilled with a clean win by an Italian over the dominant Belgian. The effect of the stage was to further tighten Merckx’s iron-clad grip on the maglia rosa and move Gimondi up to third place. Stopping at Rome for the nineteenth stage, Victor van Schil and Joaquin Galera left urine samples that got them disqualified from the race. That left only the twenty-first stage with its finish at Block Haus as a possible impediment to Merckx’s triumph. Franco Bodrero won the stage, the organizers not yet knowing that he had been positive for drugs at San Remo. Merckx wasn’t able to repeat his 1967 Block Haus triumph, but he didn’t have to, he finished ahead of all the other contenders. 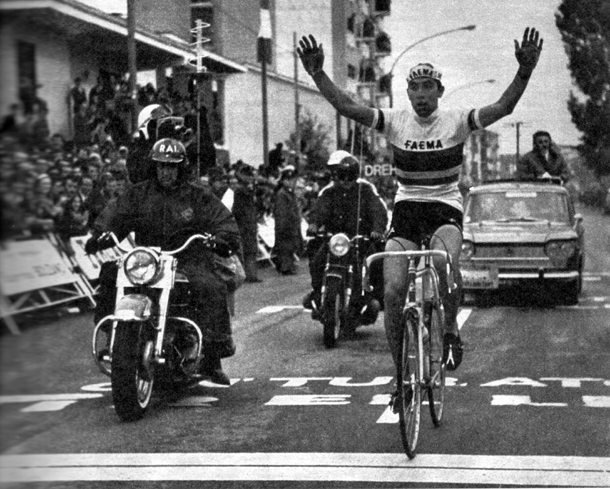 There remained only the stage into Naples, won by Merckx teammate Guido Reybrouck. Merckx became the first Belgian and fifth foreigner (after Koblet, Clerici, Gaul and Anquetil) to win the Giro d’Italia. Gimondi and Mariano Diaz came up positive after that stage. Along with Mario di Toro’s refusal to give a sample, that made ten riders caught in the Giro’s first attempt to control the pervasive doping that had overwhelmed the sport. Merckx had won all three major classifications: elapsed time, mountains and points. The good God had not sent another Coppi to Italy: He had sent him to Belgium. Gimondi, who had won the Vuelta that spring, was expected to have been a serious contender for victory in this Giro. But, like the rest of the field, he was, in the words of La Gazzetta, “left reeling” by Merckx’s powerful assault. Gimondi was outraged by the doping positive and was able to show that the analysis for amphetamine was triggered by his ingestion of Reactivan, a trade name for fencamfamine, a stimulant drug many athletes of the era used for its amphetamine-like effects. Its metabolites could look like those of amphetamines to the drug testing machinery of the time, hence Gimondi’s positive. In 1968 Reactivan was not a banned drug and Gimondi was exonerated. That September Adorni became the World Road Champion after a brilliant ride at Imola, Italy, leaving second-place Herman van Springel almost ten minutes behind. It would be worthwhile to take a look at the bikes of the time. Instead of riding the team’s stock bike as supplied by the contracted cycle factory, many top pros would have a skilled custom framebuilder build frames that would then receive the team’s paint and decals. Merckx, for instance started off riding the stock Superia and Peugeot bikes. In his second year with Peugeot, like several riders on the Peugeot squad, Merckx had Milan builder Faliero Masi build his bikes. Merckx has expressed contempt for the Peugeot bikes with their dated design, saying they “rode like dogs”. Later Merckx used Colnago, De Rosa and Kessels to build his frames. There was nothing new here, Coppi had ridden Masi-built frames. And until much later with the emergence of non-ferrous frames, this tradition of using a “framebuilder of trust” continued. Claudio Chiappucci sometimes raced frames built by Antonio Mondonico. Frames of the era were lugged, double-butted steel with tubing generally produced by Reynolds (Masi’s preference) or Columbus. The frames of the age look flimsy and spidery to today’s eye with their 25mm (about one inch) diameter top tubes and 28mm downtubes. The groupset of choice was Campagnolo Nuovo Record; with some modifications as it morphed into Super Record it would remain the pros’ preference through the mid-1980s. In 1968 the only component missing from the Campagnolo group was a brake set, which came out the following year. In the mid-1960s Universal center-pull brakes were the most common but by 1968 most Italian pros had switched to Universal side-pull brakes. Anquetil, being French, used Mafac center-pulls. Center-pulls allowed generous tire clearances yet still gave the rider a powerful set of brakes. As builders moved to tighter frame designs the riders would change to simpler, more precise side-pull brakes. I counted 36 spokes on the wheels Merckx used in the Tre Cime di Lavaredo stage. By the mid 1970s, as the metallurgy of spokes and rims improved, 32-spoke wheels would become more common.